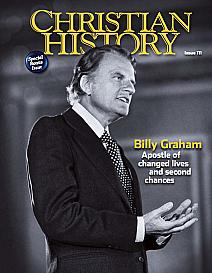 Issue 111 of Christian History Magazine is titled “Billy Graham: Apostle of Changed Lives and Second Chances” and is completely devoted to the the legacy of Graham. You can see this issue here. I am excited to peruse this issue. Christian History magazine’s guest editorial consultant, Grant Wacker, a Duke Divinity School professor and author of America’s Pastor: Billy Graham and the Shaping of a Nation, leads a team of distinguished historians and writers who tell the epic story of Mr. Graham’s life and career, a unique contribution to the character and spirit of the evangelical church, the nation and the world. The issue’s 10 articles, rare archive photos and intimate writing style documents the life and family of Billy Graham, who has personally shared the salvation message of Jesus Christ with more people than any other individual in history. My poem of the week last week was a new baptism hymn written by one of my pastors, Justin Wainscott. We really do have a shortage of good baptism hymns, which is odd for Baptists, so I was delighted to see this new hymn from Justin, whose poems I have posted here before. It is a wonderful thing to have pastors produces theologically rich poetry, which we can sing congregationally! The hymn is in common meter so it can be sung to a number of well known tunes including the tune commonly used for “O God Our Help in Ages Past” (St. Anne). Get buried ’neath the wave. We’re raised to life anew! In Christ, we are belov’d. My poem of the week this week comes from one of my favorite poets, Edgar Guest. I love how Guest speaks of the beauty of everyday life, home, family and perseverance. There is simple wisdom here. Out distances the fretful men. The pain required their skill defeats. Plus willingness to work and wait. One must have patience to be great. The man of patience dares again. I selected a Top 10 from the books I read this year (with some help by combining!). These 10 aren’t listed in a particular order, and they made this list for various reasons ranging from sheer enjoyment to level of impact on me. Following the Top 10 are some more books I enjoyed reading this year (in no particular order) as well as some disappointing ones. The Trinity and Our Moral Life According to St. Paul, Ceslaus Spicq- This is a wonderful little book! It is at the top of this list intentionally. Spicq’s commentary on the Pastoral Epistles is famous, but it has never been translated into English. I bought this book because Fred Sanders recommended it saying Spicq engages the Pastorals significantly in it. I intended simply to peruse the book to find his engagement with the PE but I was captivated and read it straight through. Spicq (1901-1992) was a well-established biblical scholar, but he writes here not to impress the academy but, as a true pastor, relying on and rooted in the truthfulness of the Scripture he expounds the text for the spiritual edification of his readers. It was refreshing, edifying, and helpful. Only in one place (lack of impact of the fall on reason) did I significantly differ from him and that was a minor point in the book. Destiny of the Republic: A Tale of Madness, Medicine, and the Murder of a President, Candice Millard- As well as, her two other books, The River of Doubt: Theodore Roosevelt’s Darkest Journey and Hero of the Empire: The Boer War, a Daring Escape and the Making of Winston Churchill. I admit I am cheating here to sneak in three books under one listing, but Candice Millard is the new addition to my list of favorite authors. I read Hero of the Empire and then went on to read every other books she has written. I eagerly await her next book, whatever it is. This is historical writing at its best! She uses her sources well, letting them make the point and not intruding into the story. She weaves into the immediate story supporting history, geography, botany, medicine, etc. in such an engaging way. I began wanting to know about James Garfield, Roosevelt or Churchill but along the way learned a surprising amount about 19th century medicine, Alexander Graham Bell, the Amazon jungle- its plant life and history, and South African history among many other things. These books are amazing. Watership Down, Richard Adams- I have often heard people praise this book but years ago when I started to read it to my children, who were pretty young, the early vision of the field of blood put us off. I returned to it this year and was entranced. The way the rabbit world and broader animal world (and language) are conceived is amazing. The author clearly did his homework on the animals as well. Listening to audio was particularly good with the animal vocabulary. Some astute observation about society. Out of the Ashes: Rebuilding American Culture, Anthony Esolen- I am interested in everything Esolen writes because he writes so beautifully and insightfully. This book did not disappoint. It is a profound and helpful challenge. The Sackett Companion: A Personal Guide the Sackett Novels, Louis L’Amour- I finished the Sackett series early this year and then really enjoyed this companion which filled in gaps and made connections as well as giving L’Amour’s further thoughts on the stories. It was sad to hear of further installments of the series which he had planned but obviously did not get to before he died. Outside of the Sacket series I particularly enjoyed The Ferguson Rifle and Dark Canyon this year. The Green Ember and Ember Falls, S. D. Smith- Very good! This was probably the favorite book I read with my younger children this year. It has some similarities to Redwall (rabbit kingdom, religious community) but with stronger, or more overt religious/moral overtones. It is a great story well told. We also enjoyed the brief prequel Black Star of Kingston, and we are eagerly awaiting the next book of the series. Stonewall Jackson’s Book of Maxims, ed. James I. Robertson, Jr- Fascinating! Leading Civil War scholar Robertson discovered the oft discussed but lost book of maxims which Stonewall kept and has here reproduced it with photos of the pages and the text retyped with Robertson’s commentary on the sources of the maxims and instances where one can see the principle of the maxim illustrated in Jackson’s life. This intentional approach to moral improvement- common in the Victorian era- could be instructive to us today. I find much good here regarding looking at those who talk to you, giving full attention, not interrupting, not going on too long with your own talk or dominating a conversation, working to please others, to be accommodating, etc. Bruchko, Bruce Olson- I have often heard this book prosed and finally read it myself. I promptly assigned it as reading for my homeschooled teenager. It is a powerful story of suffering, perseverance, dependence on God in the pursuit of missions and effort to explain the gospel in understandable ways. God’s Smuggler, Brother Andrew, John and Elizabeth Sherrill- Unintentionally but quite beneficially this for me was a year of reading missions biographies. This is another that has sit on my shelf a long time. It was also challenging and encouraging. 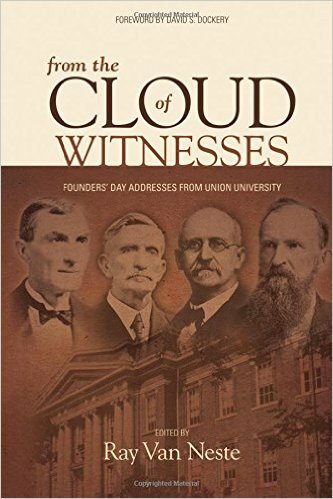 Southern Baptist Pioneer: Oliver Hart, the Evangelical Revival, and the Making of the Baptist South, Eric Smith- A fascinating read! I was blessed to get to read this in draft form. It is due out next year I believe. Eric has done a great job telling the story of this Key Baptist leader in the colonial South. Much here to glean for ministry today. For the Glory: The Untold and Inspiring Story of Eric Liddell, Hero of Chariots of Fire, Duncan Hamilton- I have loved the Eric Liddell story since I saw Chariots of Fire as a kid. This great biography corrected numerous historical errors of the movie and then told the story of his mission efforts and eventual death in China. It is critical of Liddell’s mission agency. Thanks to David Carothers for recommending this one. I also read Liddell’s The Disciplines of the Christian Life, a booklet which was unpublished until after the Chariots of Fire movie which motivated a guy to go locate the book. I really liked the introduction. The Heavenly Man, Brother Yun with Paul Hattaway- This was also a challenging story of faith, sacrifice and obedience as Brother Yun sought to serve the Lord in his native China. I am aware that there is some controversy over this book including some of the miraculous claims. I do not know enough to have an opinion on this, but I found the book challenging nonetheless. Calvin, Bruce Gordon- This is now the standard biography on Calvin, and I found it well-written and informative. The Church Comes from All Nations: Luther Texts on Mission, Volker Stolle- A great collection of quotes from Luther (lengthy ones showing context, not mere snippets) showing his concern for world mission (contra critics). Luther, Calvin and the Mission of the Church: The Mission Theology and Practice of the Protestant Reformers, Thorsten Prill- Another good rebuttal of the negative view of the Reformers. Deals with literature I did not yet know of. John Calvin: Man of God’s Word, Written and Preached, Peter Barnes- A good little book on Calvin’s commitment to Scripture. The American Spirit: Who We Are and What We Stand For, David McCullough- I really enjoyed these speeches given at various places including some key historical spots. McCullough communicates so well. America: Personal Reflections of An Historian, Stephen Ambrose-I like reading Ambrose and these reflections are worthwhile. The Greatest Knight: The Remarkable Life of William Marshall, the Power behind Five English Thrones, Thomas Asbridge- This was fascinating. I had my eye on this since it came out and finally found an inexpensive, clean copy at Goodwill. This story emerges from the discovery of a document which had been lost for centuries. Marshal served as the epitome of knighthood and his career spans some of the most dramatic history of England. Coolidge, Amity Shlaes- This was very informative, with much detail, though it doesn’t sing like Millard’s books (above). I also enjoyed The Quotable Calvin Coolidge: Sensible Words for a New Century by Peter Hannaford, which is a nice collection of quotes showing Coolidge’s belief in hard work, thrift, perseverance, compassion and the necessity of religion. Lion of Liberty, Harlow Giles Unger- I really like Patrick Henry and this was an engaging biography of him, though it seemed snide in places. I’d like to read Thomas Kidd’s bio now. Thomas Jefferson: Revolutionary: A Radical’s Struggle to Remake America, Kevin Gutzman- Very good first chapter on Jefferson’s understanding of how the USA government should function. The Perfect Storm: A True Story of Men Against the Sea, Sebastian Junger- A powerful story which made me fear the sea more. Moving accounts of emptiness of many lives. Also interesting on dreams. Forgotten Founder. Drunken Prophet: The Life of Luther Martin, Bill Kauffman- brilliant writing, though profane in many places. Important examination of Anti-Federalist arguments and the results today of ignoring them. I forgot I had read this before and listed it as a best read in 2011! Sasse- On the Record: A Collection of Senator Ben Sasse’s Most Influential Speeches, Ben Sasse- A good collection of speeches. I like his emphasis on the constitution, limited government, separation of powers, the need for the Senate to get down to real work and taking on the key issues of the day. Autobiography of Blackhawk- A sobering firsthand account of why this Native American chief fought for the British in the War of 1812. You Are What You Love: The Spiritual Power of Habit, James K. Smith- Though I think he overplays his hand in places and takes too dismal a view of the intellect in formation, I appreciated much in this book. I especially appreciated what he says about the importance of formative worship. The Death of Scripture and the Rise of Biblical Studies, Michael Legaspi-The book is not as exciting as the title, but it is important and valuable. It is largely a history of one German university in the 18th and 19th centuries. You can get the key points from the introduction and first chapter. Legaspi helpfully critiques the move in academia from seeing Scripture as Holy Writ to seeing it as a document to dissect. The Benedict Option: A Strategy for Christians in a Post-Christian Nation, Rod Dreher- I enjoyed reading this book with a faculty group at Union. The book is better than some of the hype around it. I liked Esolen’s book (above) better, but I resonate with much of what Dreher writes here and have seen this sort of thing being done in local churches. Lord of the Flies, William Golding- A sobering tale illustrating the depth of human depravity and the thin veil of “civilization” which typical covers that depravity. The Flames of Rome, Paul L. Maier- Good historical fiction, meticulously researched, careful to follow all historical data we have and then fill in gaps only in plausible ways. Then nicely written. Racy in places, but very moving. The danger of first century Christians hit me afresh even though I’ve read about these things for a long time. The Time Machine, HG Wells- I think I had read this before, but this is another helpful critique of society clothed in science fiction. Pudd’nhead Wilson, Mark Twain- It was fun to re-read this classic tale with one of my sons. It is classic Twain with significant critique of societal ideas of race and class. The Tower Treasure, Franklin W. Dixon- It was fun to re-read this one to my younger children. It is quite simple, but I appreciated the strong family dynamic and the affection between father and sons which is typically absent from young adult literature and children’s movies today. Kingdom’s Dawn, Book 1 of the Kingdom Series, Chuck Black- good, fun read. As in his other books Black tells a story of knights that nicely parallels a portion of the biblical storyline. Parts are quite good and parts are a bit of a stretch. Still it is fun and informative. My youngest, who has been less interested in our reading times, began to ask for it and said, “This is a good book.” We also enjoyed the next volume in the series, Kingdom’s Hope. Son of a Wanted Man, Louis L’Amour- The dramatized audio did not come across well (melodramatic, cheesy) and apparently it deviates a good bit from the book. 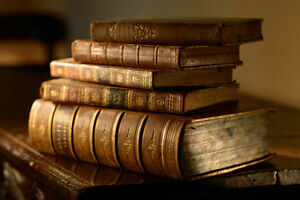 It is sad that they devoted time and energy to this rather than getting good readings of other books which connect to the Sacketts. Hondo was not so good either. The Call of the Wild, Jack London- This was another re-read with my homeschooled teenager. Fair, not great. I don’t see what the great admiration for it is. Maltese Falcon, Dashiell Hammett- A mediocre story with lame characters, not a one to like. They are all no-count, untrustworthy louts. It isn’t even told in a striking manner. I don’t see why this has received praise. 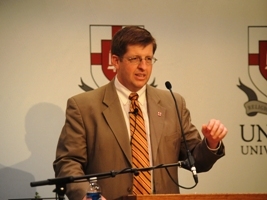 Here is the sermon I preached earlier this semester on 2 Timothy 2:14-26 at Midwestern Seminary’s chapel. Chapel October 4, 2017 with Dr. Ray Van Neste from Midwestern Seminary on Vimeo. English this month. 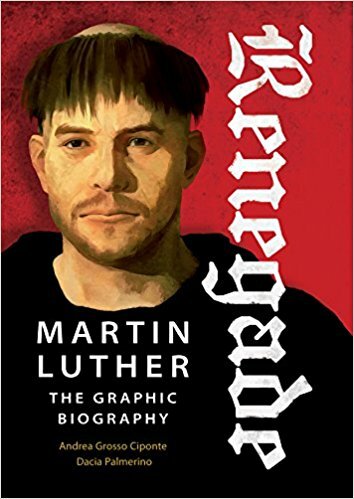 The authors clearly know the Luther story well and seems to be aware of some of the different debates on Luther. They do have Luther giving his defiant response at Worms on the first day he was questioning rather than on the second after asking for a day to consider the demand to recant, but this does not negate the good work throughout. The artwork is edgy, capturing well the darkness Luther grappled with and other situations like the peasant revolt and the Black Death. This is a great tool to help people encounter Luther afresh or to engage them for the first time. 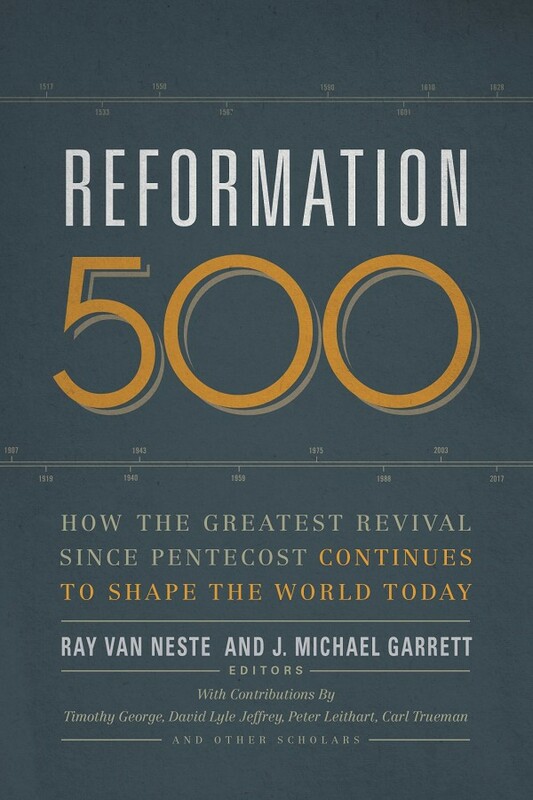 I am glad to see this coming out just as we approach the 500th anniversary of the Reformation. The latest issue of the Southeastern Theological Review came out today, and it focuses on the 500th anniversary of the Reformation. You can see the cover to the left, but it contains articles by Nathan Finn, Malcolm Yarnell, Stephen Eccher, and myself. Nathan’s essay and mine come from presentations given at the REF500 event at Union earlier this year. 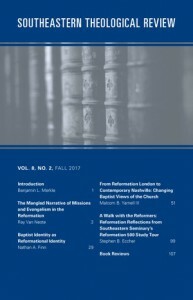 My essay is titled, “The Mangled Narrative of Missions and Evangelism in the Reformation,” and is a continuation of work on a topic I’ve returned to a few times over the years. I chose “mangled narrative” for the title because the truth on this issue has been obscured over the years. In the minds of many people, it is an established fact that the Reformers, particularly Calvin and Luther, had no interest in evangelism or missions. However, this is completely untrue and unfair. In my essay I trace this opinion back to an influential 19th century German missiologist, Gustav Warneck, and argue his anachronistic definition of missions caused him to completely miss the Reformers. Although there is good scholarship debunking Warneck, most of the English language surveys of missions have simply repeated Warneck over the last century without engaging the scholarship which has contradicted him. When we understand what the Reformers were doing, and when we actually read their own words we find a passion for souls which will convict us today. Rather than passing on the slander of our brothers, we’d do well to learn from these men who endured more than many of us can imagine and labored intently for the salvation of souls.